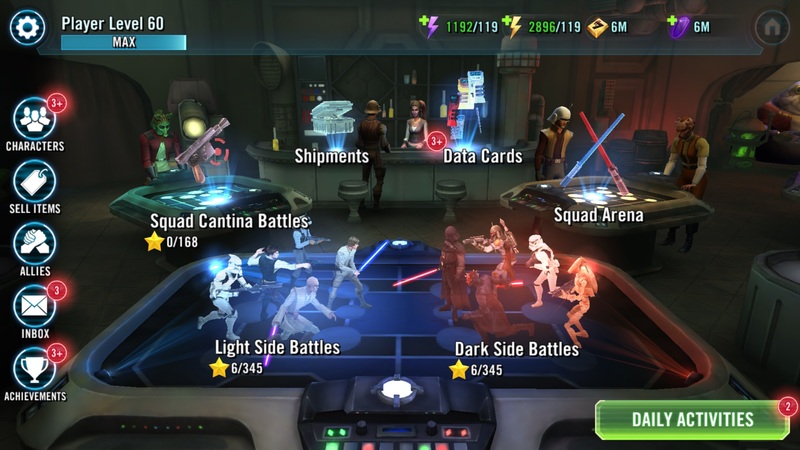 The purpose of this guide is to give new players or players starting an alt account/rerolling a new account an optimal path to follow for success in Star Wars: Galaxy of Heroes. Success, for the purposes of this guide, is defined as positioning yourself for completion of GW each day, achieving the highest arena ranking possible and having a powerful and flexible roster available to complete new content. This guide will do little to prepare you for future shifts in the meta (which are difficult, if not impossible, to predict) and do little to allow early flexibility in team composition. Before anyone is offended, you can be considered a successful player by playing this game in any number of different ways. From collecting as many character as possible to trying out that Ewok team you’ve always wanted, Whatever allows you to derive the most enjoyment from SWGOH should be considered a success. It is a game after all. But bear in mind, this guide is not directed at you. This guide will also assume that you have a basic knowledge of SWGOH game mechanics and structure. We do no intend to micromanage your playing sessions. Google can help fill in any blanks as you go. This guide is intended for free to play players or for players who are willing to invest only modest amounts of money into the game. “Whales” can feel free to ignore this guide, as the additional characters and resources available to you will render much of this advice second or third-rate at best. The advice in this section relates to those playing on iOS only, we imagine the mechanics are similar for those playing on android but we are too unfamiliar to say for sure. Before getting too excited, the optimal path to begin playing can take days to weeks for those committed. If you truly want to compete at the highest levels as a free to play/modestly spending player, you will likely create multiple accounts before finding one worth continuing on. We are looking for two things with our new account. A good “starting character” and a good “initial arena ranking”. If you lack patience, one or the other is acceptable but be aware that you are starting even further behind the curve than those who will outspend you. An important note to consider, your “time zone” when creating an account will be whatever time zone your phone is set to when you first log in. If 530-550pm local time is a bad time for you to log in to ensure the highest arena ranking possible, consider adjusting your initial time zone accordingly. An added benefit of this trick is to have a less competitive time of day in which to compete for your arena payout. Eastern time and Pacific time are two of the more heavily contested time zones. Step 1: Head to applied.apple.com and create a new game center account/appleid. Use a GMail account for this step unless you are comfortable with creating only one account and risking starting behind. You want to use a GMail account, because GMail email addresses ignore periods and applied’s do not. For example, with one GMail address, such asberniesanders4prez@gmail.com, you can create b.erniesanders4prez@gmail.com, be.rniesanders4prez@gmail.com,ber.niesanders4prez@gmail.com, b.er.nie.san.ders4prez@gmail.com and so forth. This will save the time and frustration of creating multiple email addresses. Step 2: Launch SWGOH and complete the tutorial. Unfortunately, this step cannot be skipped or auto completed. This process will take you through light side battles 1-A and 1-B. Change your in game name when offered if you choose. At the time of this writing, there is no way to change it later. Step 3: Collect the 200 crystal from your Inbox. Step 4: Complete light side battle 1-C. Purchase energy and sim tickets for 50 crystal and sim light side battle 1-C twice. Collect your free Jawa and claim your daily activities. Step 5: At this time you should be level 5. Press the gear in the top left corner of your home screen and connect your account to facebook. This will grant you 200 crystals. Step 6: Purchase a single chromium pack and cross your fingers… At the time of this writing, your first pack will seemingly contain a “non-Chromium only” Light Side character. Because of the way in which new characters are unlocked and upgraded, it is important that this character be one worth playing for at least 2 weeks, ideally for longer. Otherwise, we may be stuck with a less than competitive team and fall behind the whales. Friends who we trust have also reported to me that they have unlocked Fives and Teebo in this fashion, furthering the assumption that this character will be a “non-Chromium” Light Side character. Rey is the top-tier character which can be unlocked in this fashion, and our recommendation is that you create accounts until unlocking her. She will be overpowered for your first 50-55 levels, even at 4 stars, and competitive at 4 stars until the mid-60’s. By this time, you should be close to 5 staring her, where she will remain competitive even at level 70. The second best option is Barriss Offee, who will ease the frustration of GW for the forseeable future and is a reasonable, though not great, squad arena healer until later levels. If you aren’t extremely patient or luck isn’t on your side, any 4 star character will suffice for the time being. Arguments can be made that Luminara Unduli at 3 stars and Qui-Gon Jinn at 2 stars are reasonable options to save time spent farming shipments early in your progression, however, we don’t recommend this route as a free to play or modestly spending player as we need a 5th character through our leveling process (unless you are comfortable running Jedi Consular, Jawa, Talia, Royal Guard or Clone Wars Chewbacca as a 5th for some time). 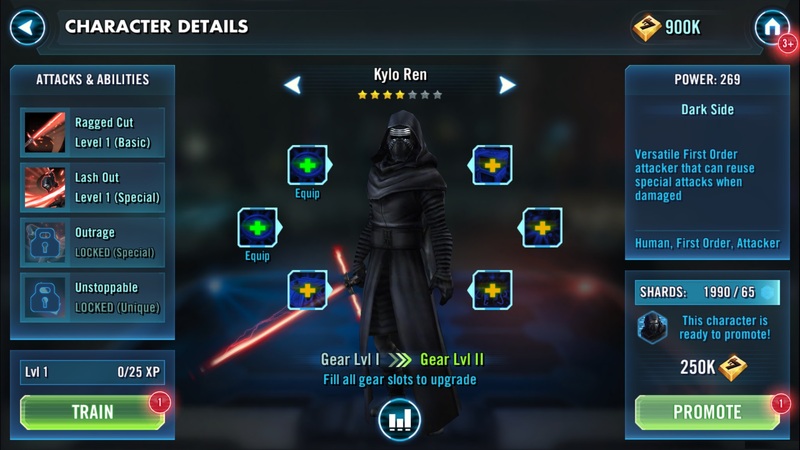 If you are unhappy with your starting character at this point, disconnect SWGOH from your Facebook and start over at Step 1. Note that for your first account created within several hours, you may want to continue through step 7 to see where your new account would stand with initial arena ranking. If the initial ranking is poor, come back to SWGOH at a later point and try again. Nothing is more frustrating than unlocking Rey only to find that your initial Arena Ranking is 19,764. Step 7: Continue to level your account to level 8 by using sim tickets to complete light side battle 1-C several times and by claiming more daily activities. At this time you will unlock squad arena and be able to see your initial arena ranking. SWGOH groups the 20,000 most recently created accounts into new arena ladders, sometimes referred to as “shards”. There is a massive benefit to starting as close to the top of a new ladder as possible. In our experience, ladders are filled and new ladders are created approximately every 1.5-2 days. Starting as low as possible is ideal. Below 500 is great, below 3,000 is acceptable and anything above 5,000 is probably not worth your time unless you have unlocked Rey or Barriss. Crystals and arena shards are distributed at 6pm in your local time zone starting immediately, so quickly achieving a rank 50 or better is essential for optimal play. At this time a decision must be made. In a perfect world, our new account would be ranked below 100 and we would have unlocked Rey. However, this is incredibly unlikely no matter how many accounts we create. Finding a comfortable balance between initial arena ranking and starting character is important before continuing further. We would argue that for a completely free to play player, initial arena ranking is the most important factor. For a player who intends to spend a modest amount of money in the game, a good starting character is of more importance (players who are willing to spend a modest amount of money can refresh arena battles several times on day 1 to achieve a lower arena ranking quickly, comletely free to play players do not have this luxury). When you are comfortable with your situation, you may continue on. The team we will farm initially includes one character from each farmable location. Squad cantina shipments will be dedicated to Qui-Gon Jinn, squad cantina battles to Geonesian Soldier, squad arena shipments to Darth Sidious and Galactic War shipments to Luminara Unduli. This is why attaining Rey, Barriss or a reasonable 4 starred character from our first single Chromium pack was so vital. All of our resources are accounted for in creating 4/5’s of a squad arena team. Without a reasonable starting character, barring a lucky bronzium pull we are left with Clone Wars Chewbacca, Jawa, Jedi Consular or Talia as our 5th. None of which are better than average in squad arena. A team of Qui-Gon Jinn (as leader), Geonesian Soldier, Darth Sidious, Luminara Unduli and our 5th can contend for a top 5 arena spot from early levels all the way until 70. By max level, we will have the resources available to replace Sidious (who loses some viability in endgame squad arena, but will remain an asset in endgame GW) and to have meaningfully advanced our 5th (and to keep her on the team if that 5th is Rey, or to replace them if it a lesser character). Our goal is to reach level 70 as quickly as possible and having wasted as few resources as possible. Complete all available challenges (within reason, the tank challenge and the healer/support challenge can be difficult for newer accounts. Don’t level any characters with the sole intention of helping to complete challenges at this point). Claim all bonus energy at 12pm, 6pm and 9pm. Complete all 5 free squad arena matches. Advance as far as possible in GW. Purchase all valid gear shipments upon each shipment refresh. Exhaust cantina and regular energy supplies regularly so that natural refresh can occur. Spend energy and other resources wisely and in a streamlined way, as will be outlined below. The PVE content in this game is your primary source of gear and training droids. It should be an area of limited time investment as you will likely only complete each battle once and sim each battle thereafter. If you are going for 100% optimized play, some would argue that you should never sim a battle in which you can earn ally points. By using a sim ticket on a battle you are slightly reducing the number of bronzium cards purchaseable. This will have a negligible effect in the long run, and is only worth considering for those with an abundance of time to play. PVE content should be cleared only on a “need to clear” basis. All regular energy should be spent to advance the gear of your 5 person arena squad plus Jedi Cosular. Only once each of these 6 character is at max gear attainable for your current progress should you advance further in PVE content. Advancement for the sake of advancement is a waste of resources. The only exception may come at higher levels, where it may be worth advancing to a point where you can unlock desired hard mode nodes to begin farming shards of hard mode only characters that you desire. Hard modes initially should not be used as a source of gear. Consider them only a source of shards for desired characters, predominately characters that can only be advanced via Chromium packs and hard modes. We recommend farming Royal Guard and Rey for your early hard mode missions. However, if you KNOW that you have no interest in Rey or Royal Guard later in the game you can complete your 5 daily hard modes as you see fit. Limiting yourself to only the 5 hard mode battles needed for completion of the daily activity is an acceptable approach, but completing all 3 battles for both Rey and Royal Guard is our preferred method. Ultimately, additional nodes unlock for Rey and Royal Guard which can be farmed as well if they are desired or if we have excess energy and no gear slots to fill. First Order Tie Pilot, Ewok Elder, Ima-Gun Di and Anakin Skywalker present reasonable alternatives to farm depending on desired team composition and personal goals. Completion of Galactic War daily is perhaps one of the most frustrating aspects of SWGOH at the time of this writing. Matchmaking appears to be bugged, and those who have attained high squad arena rankings may find this mode to be more difficult than intended. However, using the team outlined above along with a geared and leveled (and eventually starred) Jedi Consular, completion on a majority of days is possible. Our personal strategy is to use Qui-Gon Jinn (as leader), Jedi Consular, Luminara Unduli, Geonesian Soldier and your next strongest DPS (Rey if you have unlocked her, likely Darth Sidious if not). Heal early and heal often, whenever a character dips below 2/3 health. Use Jedi Consular’s heal first if possible as it is on a shorter cooldown. Extend battles as long as possible by leaving a healer and tank alive at the end of most fights to limit damage taken and to grant extra turns to allow cooldowns to reset. Retreat and reset battles liberally. Each time you swap a character in your team, the actions the enemy team takes changes. If you swap positions of characters, it can change who is attacked and it can also change who from your team comes in on an assist attack. Begin most battles by experimenting and finding the best outcomes after several turns. From GW shipments, farm Luminara Unduli first. A second healer is necessary to complete GW at this time and she is top-tier viable in squad arena until advanced endgame. Reasonable secondary farms once Lumi is completed include Poggle, Tusken Raider, Captain Phasma and IG-86. Our goal in squad arena is to reach a sub-20 ranking as quickly as possible. The 150 crystals (plus 50 from our daily activities), will allow us to purchase two regular energy refreshes and one squad cantina refresh daily without spending any money on the game. Excess crystal gained by ranking sub-10 can be saved for later in our progression for additional squad cantina refreshes, hard node refreshes, buying hard mode only shards from shipments or to purchase additional squad arena matches. Until level 60, it shouldn’t be much of a challenge to beat any non-whale team if following the outline of this guide. Always choose the match that will allow the highest ranking unless personal experience dictates otherwise. It is sometimes worth spending 50 crystals to refresh squad arena battles if you are relatively certain that you can advance to a higher prize tier with that purchase. From squad arena shipments, we recommend 7 starring Darth Sidious first. However, 7 starring Asajj Ventress is a reasonable alternative. She becomes more viable than Sidious in endgame squad arena (at least on offense until her AI is overhauled) and presents the most reasonable alternative to any of our recommended starting 5. Sidious is, however, stronger on defense than Asajj and better prior to reaching endgame. The difference is small, and personal taste can dictate your decision in this case. Reasonable secondary/tertiary farms include IG-88, HK-47, Stormtrooper Han, Admiral Ackbar and Savage Oppress. If you are a moderate spender or achieve a high enough arena ranking to accumulate excess crystals after a daily squad cantina refresh and two daily regular energy refreshes, crystals are best spent on one additional squad cantina refresh, two additional regular energy refreshes, hard mode node refreshes of desired characters, purchasing hard mode only character shards from regular shipments and purchasing of credits. DO NOT waste these excess crystal by buying Chromium packs. You will only end up with a lot of underpowered, unplayable characters or shards for characters that are free to farm regardless. Chromium packs are only worth the purchase if you intend to spend $1,000 or more on this game. The Squad cantina is very straight forward for an optimized approach to play. Geonesian Soldier is the first node available and should be the only node played until he reaches 7 stars. He is currently a core character and vastly superior to any other option (outside of very specific team compositions). Valid secondary options open up ONLY AFTER 7 starring Geonesian Soldier. 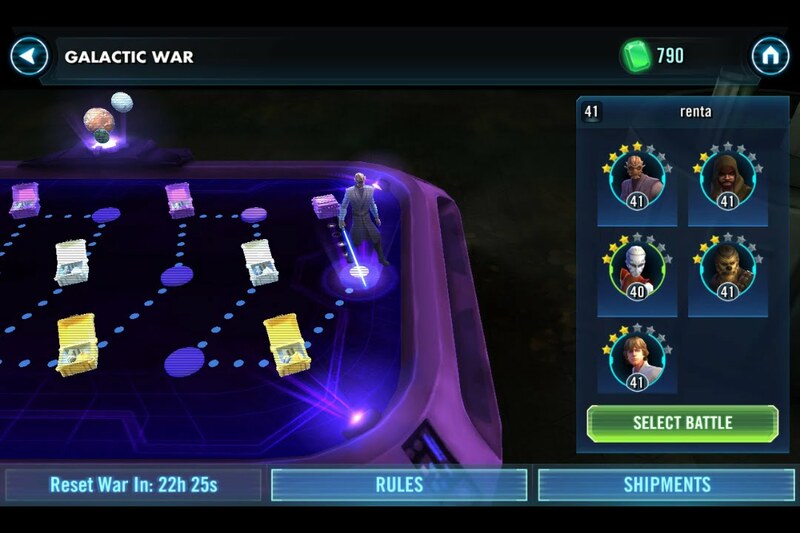 Our recommended second squad cantina battle farm is Jedi Consular, who is a vital part of completing GW each day due to his 3 turn cooldown heal, which is further reduceable via RNG. If you have Barriss or another healer unlocked as your starting character or from a Bronzium pack AND are having no trouble clearing GW daily, Jedi Consular can be lowered on your priority list or removed if desired. However, for the vast majority of us Jedi Consular will be the best option. If you have completed Jedi Consular or have determined that you don’t need him: Kylo Ren, Barriss Offee, Count Dooku and Finn are viable alternatives depending on future team composition goals. Mace Windu is acceptable if you are in a rush to unlock Yoda but is not currently competitive in endgame squad arena. In squad cantina shipments, Qui-Gon Jinn should be 7 starred as quickly as possible. In the current meta he is almost essential for success in squad arena. Farming another character from squad cantina shipments before farming him is a mistake. After completing Qui-Gon: Fives, Old Daka, Poe Dameron, Hoth Rebel Scout and First Order Officer are all valid depending upon future team composition goals. Bear in mind that Squad Cantina Shipments will be a much slower farm than Squad Arena shards or Galactic War shards, so any lack of discipline with these purchases will be exaggerated. If you plan to spend a modest amount of money on this game, the dark side starter bundle was recently nerfed and no longer offers a chance at Dooku or Savage Oppress. Greedo is not competitive in squad arena at this time. The pack is inexpensive however, and provides a nice amount of training droids and crystals just to give you a slight head start. At only $4.99 USD, this pack is still a moderate value. The droids/assassin bundle at $24.99 USD is a good value if you choose to run a droid team rather than the team outlined above. Droids are competitive until endgame, able to sustain top 20 in many shards and able to reach top 5 in shards that have only reached level 70 within the past month. If you choose to run droids, farm Poggle from GW shipments until 4 stars OR farm IG-86 first followed by Poggle. Farm Geonesian Solder to 7 stars in Squad Cantina battles. Farm Poe Dameron from Squad Cantina shipments until at least 4 stars (alternatively you can save Squad Cantina shipments or spend elsewhere if you choose to run Royal Guard instead of Poe, this will be a much longer grind however). Farm IG-88 to 7 stars from Squad Arena shipments. Use a combination of Galactic War shipments and Squad Cantina battles as you see fit to 7 star IG-86. Ultimately, you will run Poggle (leader), Geonesian Soldier, IG-88, IG-86 and Poe Dameron/Royal Guard. HK-47 is a reasonable replacement for Poggle as leader until Poggle is unlocked. 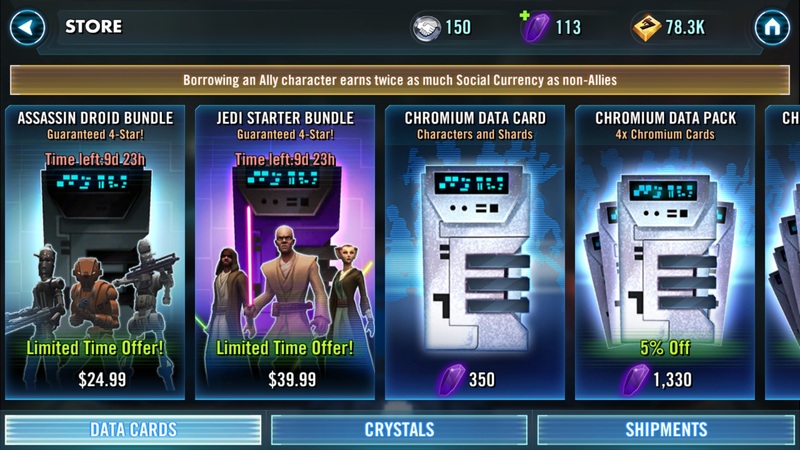 If you desire Barriss Offee or have decided to farm Asajj in place of Sidious, the heroine pack may be considered and is the third best value among the current bundles though the most expensive of those worth purchasing at $49.99 USD. Thanks to user OriolesTragic for creating this guide and helping out. We hope you enjoyed this ultimate guide for Star Wars: Galaxy of Heroes and if you have any question or want to give us feedback, feel free to leave a comment below. Thank you and have fun playing! 3 Comments on "The Ultimate Guide – Star Wars: Galaxy of Heroes"
using this guide I got a 4 star Lando and then at level 30 a 4 star Barris from a bronzium. On my way to the top 10!